I'm looking for how to view the cookies set using developer tools in IE11. I see an option in network profiling to view cookies being sent back and forth, but this is not really the same thing. It is cumbersome to use since it's per request. Surely there must be a way to view all cookies like you can in IE10. How about typing document.cookie into the console? It just shows the values, but it's something. Sorry to break the news to ya, but there is no way to do this in IE11. I have been troubling with this for some time, but I finally had to see it as a lost course, and just navigate to the files manually. In the the Internet Explorer cache. This can be done via "run" (Windows+r) and then typing in shell:cache or by navigating to it through the internet options in IE11 (AskLeo has a fine guide to this, I'm not affiliated in any way). Click on the gear icon, then Internet options. In the General tab, underneath “Browsing history”, click on Settings. In the resulting “Website Data” dialog, click on View files. This will open the folder we’re interested in: your Internet Explorer cache. 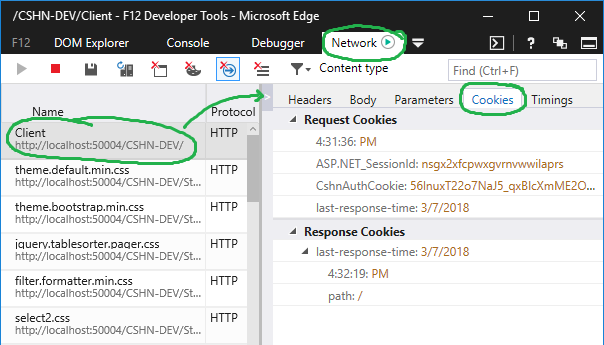 The Dev Tools in Edge finally added support for managing and browsing cookies. Note: Even if you are testing and supporting IE targets, you mine as well do the heavy lifting of your browser compatibility testing by leveraging the new tooling in Edge, and defer checking in IE 11 (etc) for the last leg. 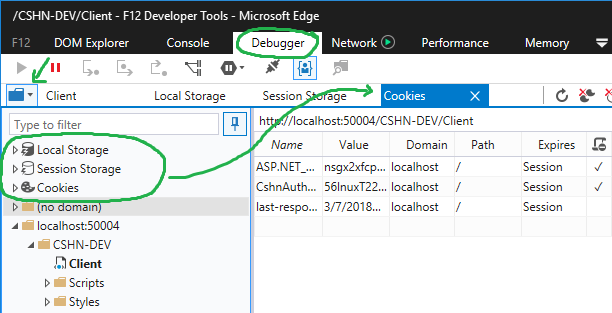 The benefit, of course, to the debugger tab is you don't have to hunt and peck for individual cookies across multiple different and historical requests. I think I found what you are looking for since I was also looking for it. Respectively the values are: Key, Value, Expiration Date, Domain, Path. This shows all the keys for this domain. Not a direct answer as previous answers already cover the topic well, but this may be somewhat relevant for some people. 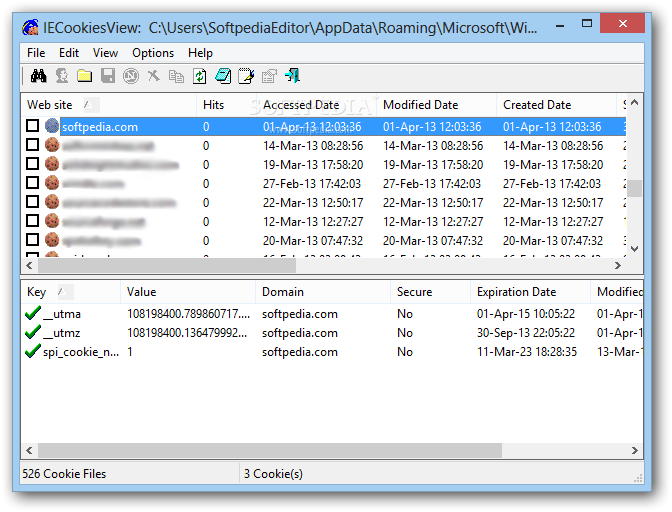 In case you're in a situation where you want to know why IE doesn't save the cookie as expected (or more likely you will probably be trying to find out why IE doesn't transmit some cookie you care about) you could do your use case and then open up File -> View privacy report window. That's one way to tell if the cookie is being blocked. So for example in network tab (like other answers suggest) you would see that cookies is being transmitted to the browser, but then on subsequent calls to the resource you don't see cookie sent from browser to the server. One reason why this happens if because of the privacy policies and you would able to see that through this View privacy report window. Not quite an answer (not “using Developer Tools”), but there is a third-party tool for it: IECookiesView from NirSoft. Hope this helps someone. Not the answer you're looking for? 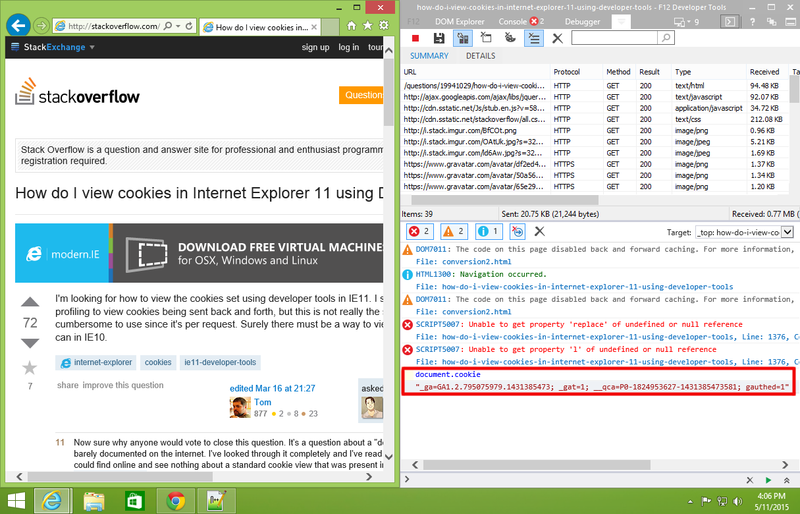 Browse other questions tagged internet-explorer cookies ie11-developer-tools or ask your own question. How do you view session cookies in Internet Explorer? Cookie set for subdomain, but IE Developer Tools show cookie at root domain. What am I missing?